No, Republicans cannot be trusted much more than Democrats. Political parties tend to be about power more than principle. Politicians are willing to fudge (and ‘evolve’) ideology in order to win elections … and reelections. To some extent, this is reasonable. After all, this nation was built by compromise. I recently watched an HBO series, “John Adams,” with the great actor, Paul Giamatti in the role of our second President. The series was based on David McCullough’s book by the same name. This 2008 mini series dramatized the life and contentious times of John Adams, and the challenging compromises hammered out to bring the United States of American into existence. “John Adams” gave us a glimpse into the formation of political parties as a means of advancing competing visions for our fledgling, representative democracy. Our second president opposed the idea of political parties even as our third, Thomas Jefferson, helped found what is now the Democratic Party. Watch President Adams wrangle with the ambitious Alexander Hamilton in the clip above. So, no, I don’t trust Republicans. Under President George W. Bush, a man I admire, the budget exploded. President George H.W. Bush (Bush I) built his entire campaign on “read my lips, no new taxes” and quickly caved on his foundational principle. Bush II, on the other hand, had a Republican Congress from 2003 through 2007. They bear some culpability for the explosion of deficit spending. 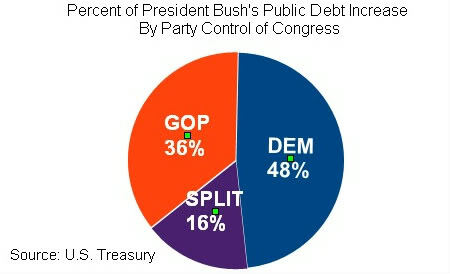 According to Treasury Department data, a little more than a third of deficit spending occurred while Republicans controlled the House, Senate, and White House during the Bush years. Forty-eight percent of it occurred when Democrats controlled the Congress, as you can see in the accompanying chart. I trust Republicans more than Democrats. But do I fully trust Republicans? No. As President Reagan always said: trust but verify. We “verify” by the candidates we select in our primaries when our trust has been violated. “So Obama is wrong for wanting to help stop the slaughter of women and children via chemical weapons while Bush got us in two wars on the possibility that Saddam may have chemical weapons. I fail to follow the logic you and many other bashers that seem to take such delight in name calling our commander in chief.